SAINT CLOUD, Minn. (December 13, 2016) — GoldnPlump.com — Gold’n Plump® SHAKERS™— a line of fresh, three-step-prep chicken breast strip kits introduced by local GNP Company—was recently voted the best new retail product of the year in Refrigerated & Frozen Foods’ 2016 Readers’ Choice Best New Retail Products Contest (Part 2). The new items first hit store shelves in September. Gold’n Plump SHAKERS captured first place with an astonishing 11,887 votes, beating out a strong lineup of contenders including everything from ice cream to cheese to craft burgers to organic salad kits. The top five winners, including Gold’n Plump SHAKERS, were featured in Refrigerated & Frozen Foods’ December 2016 issue. The special report included an online-only interview with GNP Company’s Miller. Read the full article at: http://www.refrigeratedfrozenfood.com/articles/91881-goldn-plumps-3-step-prep-chicken-breast-strip-kits-offers-meals-in-under-20-minutes. Though winning was a surprise, Miller says she’s not surprised about the popularity of the new items due to today’s busier lifestyles. “As schedules get more hectic, people tend to prepare more last-minute meals, and want products that offer quick-and-easy prep and the enjoyment of making something themselves. The Shakers line offers ready-to-cook fresh chicken raised with No Antibiotics–Ever; more preparation involvement with minimal extra work; and superior quality and flavor compared to similar frozen products.” Plus, they have no added solution, preservatives or artificial flavors, are lower in sodium, and carry the American Humane CertifiedTM seal. Shakers start with 100 percent boneless skinless breast strips perfectly sized for snacking or as ingredients in pasta, salads, wraps or sandwiches. Packets of bold, on-trend seasoned breadcrumbs add adventurous, ethnic flavors and a crunch that adults and kids crave. Miller says the flavors are chef-inspired with the goal for wide appeal and usage, and the breading is made with Panko-style breadcrumbs which are widely popular today and professional chefs’ go-to ingredient for adding texture. Visible spices and herbs in the breading add appetite and homemade appeal. Beyond the chicken itself, the packaging was designed so for no-mess prep that can be fun and fast. 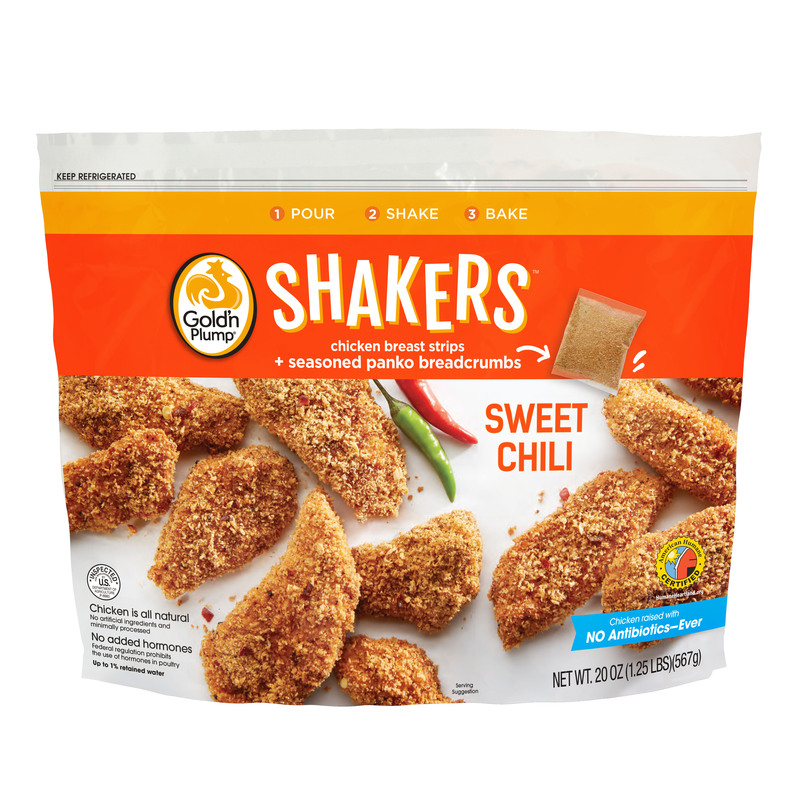 Consumers simply Pour, Shake, Bake: 1) open the outer pouch, pour the strips and seasoned breading into the shaker bag, zip shut 2) shake; and 3) bake or pan-fry. There’s no touch and less mess. “The product is really fun to use and a way to get the whole family involved in the kitchen,” says Miller. Shakers are available in five bold flavors including: Savory, Sweet Chili, Jamaican, Honey Barbeque, and Chipotle Adobo. Each 20-ounce kit includes 16 ounces of fresh, whole muscle chicken breast strips in an easy-to-open pouch, 4 ounces of seasoned breadcrumbs, and a zip-seal bag for shaking. Shaker items have a suggested retail price of $5.99 per 20-ounce kit, and available at finer supermarkets and select Target stores throughout the U.S.
Refrigerated & Frozen Foods runs the contest twice a year. Here’s how it worked. First, Marina Mayer, editor-in-chief of the magazine, reviewed all of the new retail products published in print and online at www.RFFmag.com from April to September 2016. Then, she nominated 21 refrigerated and frozen foods and beverages to be named Refrigerated & Frozen Foods’ Top 5 Readers’ Choice Best New Retail Product. According to the magazine's website, “products were selected based on uniqueness to the market, packaging enhancements, on-trend flavor profile, consumer need and better-for-you ingredients. Products were NOT selected based off of samples.” The magazine then asked its readers (retailers and consumers) to vote for their favorite new retail product. Voting was open Sept. 19 through Oct. 21, 2016. About GNP Company® | Dedicated to Healthy Food, Families & Farms. Based in St. Cloud, MN, GNP Company is a provider of premium branded and custom chicken products to retail, deli and foodservice customers nationally. Founded by E.M. Helgeson in 1926, GNP Company distributes products under the Just BARE® and Gold’n Plump® brand names. Together, the company’s more than 1,700 team members and nearly 400 family farm partners in Minnesota and Wisconsin provide enough chicken for about 5 million consumers annually. For more information about the company and its mission of “dedicated to healthy food, families and farms,” visit GNPCompany.com. Gold'n Plump® is distributed nationally by St. Cloud, Minn.-based GNP Company, a provider of premium branded and custom chicken products to retail, deli and foodservice customers. The Gold’n Plump brand's good chicken mission centers on being truly all natural, highly trimmed and free of unwanted solution, skin and parts. The Gold'n Plump All Natural line also boasts attributes of No Antibiotics-Ever and American Humane Certified farm program seal. To learn more about the Gold'n Plump brand and its products as well as find great recipes, general cooking and safe handling tips and nutrition information, visit GoldnPlump.com. Find Gold’n Plump on Facebook, Twitter, Pinterest and YouTube.